New Flooring throughout. New upholstery. ew Blinds. New Faucets. New Batteries. New Tires. New AC. Financing available. extended Warranty. Nationwide delivery. Please call 613-720-4671 to view. 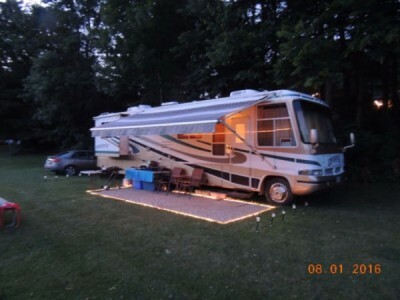 2002 Tiffin Allegro Class-A Motorhome + 2005 Liberty Jeep. 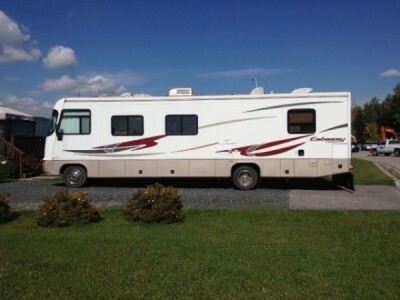 33ft motorhome, beautiful condition. One owner, 2 slides, rear bedroom, good size kitchen area. Triton V-10 engine, self leveling Jacks, generator, 3 burner gas stove and oven, and convection microwave. Stored indoors. Please call 519-928-9876 for more info. 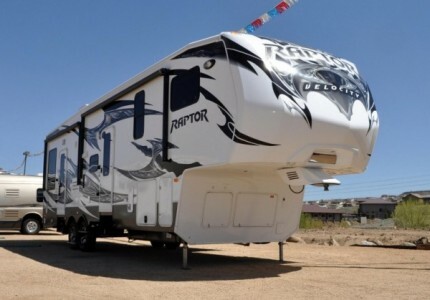 2011 Jayco Eagle 315RLDS Fifthwheel. hardly used like new inside 2 slideoutes. Please call 705-946-5560 for more info. 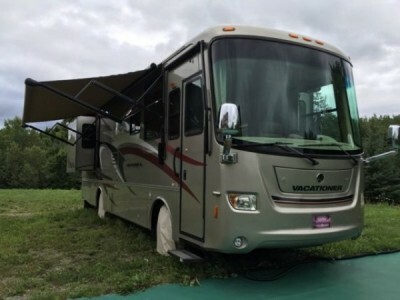 2009 Keystone Fuzion 302 Touring Edition. Original owner, Excellent Condition, very well maintained. 5500 Onan gas generator, 32ft LCD tv, Touring Edition upgrades, 30 gal fuel station w/pump, 3-10 gal propane tanks, 112 gal fresh water, 86 gal grey holding, 43 gal black holding, electric stabilizers, ramp door, and awning. Washer/Dryer hook ups in garage. Big slider between garage and living room. Corian counter tops in kitchen and bath. Ice Maker, 600 watt Rockford Fosgate amp w/ bass and indoor and outdoor speakers. Please call 819-213-2566 for more info. 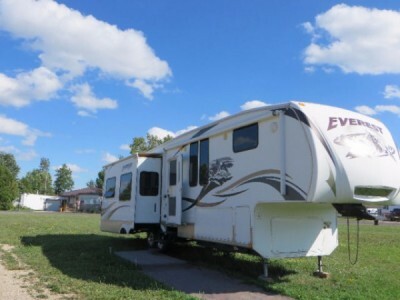 2009 Keystone Everest 345S Fifthwheel. 4 slide outs fully loaded, AC, central vacuum, 42" TV, Jensen stereo system, surround sound, in and outside speakers, ceiling fan, 3 way fridge with French doors, gas stove\oven, convection microwave, 3 PCs. bathroom with en suite privileges to a king size bed. To many extras to list, a must see! Please call 905-484-2251 for more info. 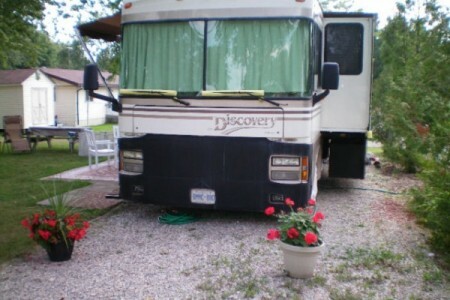 1999 Fleetwood Discovery Class-A Motorhome. Well maintained, with 97,974 KM, 130 hours on propane generator. large living room with 3 seater couch 2 seater love seat, with 2 swival captain chairs. flat screen TV with swivel mount/up, down, sideways. Booth style dining with extension on table and seat. Kitchen with double sink, 3 burner stove top with oven, microwave/convection, 2 door fridge/freezer. Lots of cabinet storage. open bathroom, sink with vanity, large glass door shower with skylight, private toilet room, 2 pocket doors between kitchen and bedroom. Walk around queen bed, double mirror closet. Prep for wash/dryer combo. 2 new roof vented air conditioners and more. also available tow car. 1999 Honda CRV with tow package and brake buddy. Please call 647-400-0879 for more info. 2008 Monaco Camelot 42Ft Class-A Motorhome. 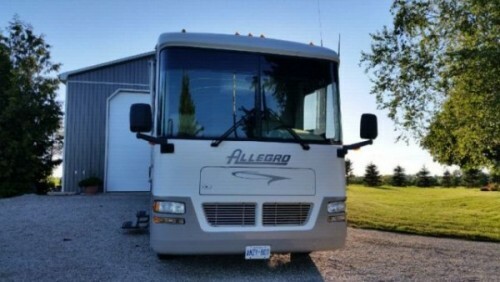 fully loaded, tag axle, 4 slides, aqua hot heating washer dryer, 400 hp Cummins, 6 speed auto, tile floors, big fridge, king bed, one slide out tray in basement, 30000 kil, never seen snow, like new. Please call 780-207-1497 for more info. 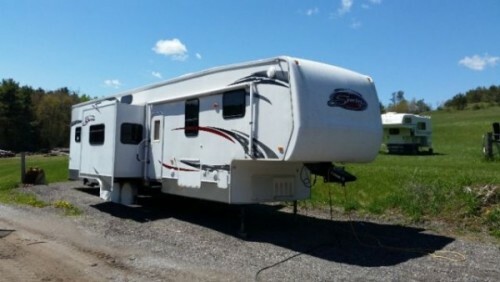 2008 K-Z Sportster 40P FifthWheel Toyhauler trailer with 12ft garage set with two motorcycle chocks with Heavy Duty Tie Downs. Sleeps 6 comfortably with all queen size beds. Full bathroom with shower. Never smoked in and in Excellent Condition! Please call 905-263-2038 for more info. 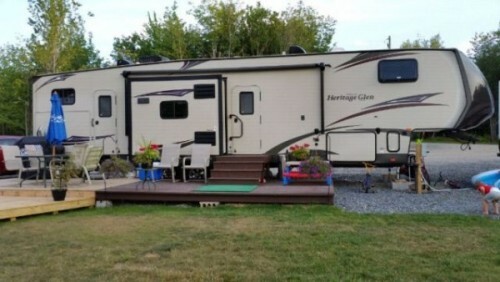 2015 Heartland Sundance XLT Fifthwheel. 3 slides. Leather couch and 2 recliners, fireplace, dining for 4. Bedroom features a queen sized bed. This trailer has barely been used and is like new. A must see. Please call 519-375-1769 for more info. 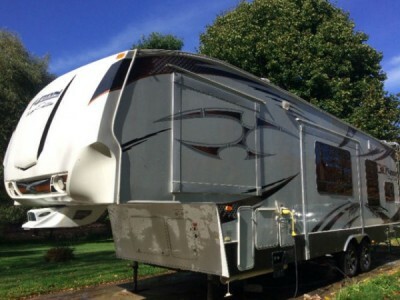 2008 Glendale Titanium 39RE Fifthwheel. Quad Slide Rear Living, Two Recliners w/ Table, Desk; Entertainment centre, Slide Out Sofa Bed; Freestanding Dinette, Double Kitchen Sink, Slide Out with 3 Burner Range/Refrigerator, Pantry, King Shower, Sink, Toilet, Slide Out Washer/Dryer Ready included wardrobe, Queen Bed w/4 Drawer Under Bed Storage, Nightstands. Central Vacuum system (hose included) wood plank floor in galley; Roof air conditioning in living room and an additional second air conditioner in bedroom; 2 stage furnace; Stabilizer jacks; Microwave; 32" TV in living room and 26" LCD TV in bedroom; TV Antenna AND Winnegard Stationary Automatic Satellite Dish; DVD Player; Free standing dinette; Awnings; Island Bed; Systems Monitor/Monitor Panel; 5th Airborn Air Ride Suspension Hitch, Black Tank Rinse Out. Also included Kingpin tripod (stabilizer), and 5th Airborn Airride Hitch. Trailer only taken to Florida during the winter months and has been stored indoors during the off season and has not been used in 4 years. Selling as no longer needed have house in Florida- immaculate condition and well cared for.Tows super easy with an HD 3/4 ton truck. Please call 613-372-2305 to view. 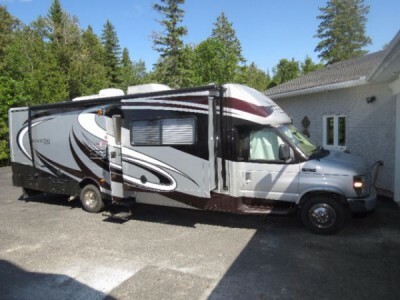 2005 Forest River Georgetown 325S Class-A Motorhome. 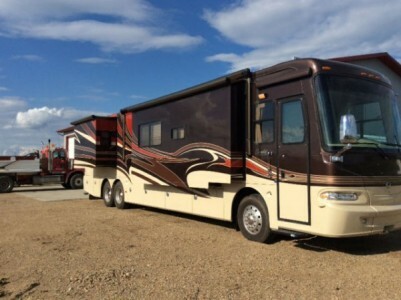 6.8L V10 gasoline-powered engine, original non-smoking owner (no one has ever smoked in it), single slide-out, sleeps 6, rear vision camera with monitor and voice, 4000W Onan generator, 1 standard awning and 3 additional add-on awnings, built-in automatic hydraulic leveling system, rear-mounted hydraulic motorcycle lift [motorcycle not included], vehicle tow kit (ask for details), LED upgrade to taillights, added backup beeper, 32" LED television, automatic lock-on satellite dish, 2 "Fantastic Fans" (auto-closing during rain). For more details call Paul @ 905-689-8607 anytime. 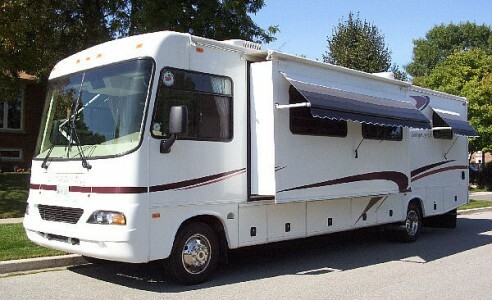 1999 Fleetwood Discovery 36T Class-A Motorhome. 1 bedroom 1slide out diesel pusher. 36ft. Full kitchen. shower, washer dryer combo, pull out couches 1 lg 1 small, dinette, well maintained, e-tested in April 2016. Has a propane generator. Please call 905-786-2790 to view. 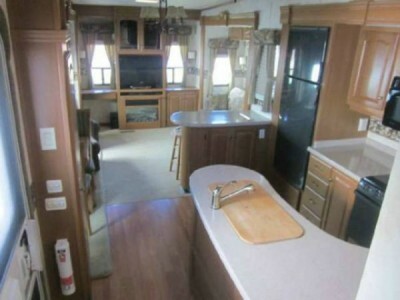 2008 Holiday Rambler Augusta 22Ft Class-A Motorhome. Ford E350 Super Duty 6.8L V-10, 10-13 mpg, shower/toilet facilities, 2 burner LP range top, dual kitchen sinks, gas/electric large double door refrigerator, large microwave oven, fold-out sofa, dinette, 20" HD LCD TV with DVD player and amplified TV antenna, 4000 watt generator, Air Conditioner, gas/electric water heater, Awning, day/night window shades, trailer hitch and wire, plus many other features. Please call 613-824-7079 for more info. 10′ garage with queen bed and U-shaped dinette (queen bed). Garage area has tv and hookups for washer and dryer. Maxx Vent system in garage. Rear ramp for loading with screened in back door. 30 gallon fueling station. 30 gallon tank for generator. 5500 watt Onan generator. Toy lock system. 2 electric awnings. 110 gallon fresh water tank. 10 gallon hot water heater. Extreme weather package (insulated and heated tanks). Black tank flush system. Huge pass thru storage compartment in front with rack system. Dual battery system. Central Vac system. Outside shower. Upgraded sound system. We added a second AC unit to the front of the trailer as well as upgraded the TV antenna. All the hoses, electrical cords, upgraded stabilization, kingpin stabilizer included. Please call 819-664-1210 to view. 2011 Keystone Fuzion 360 Toy Hauler. fully loaded. 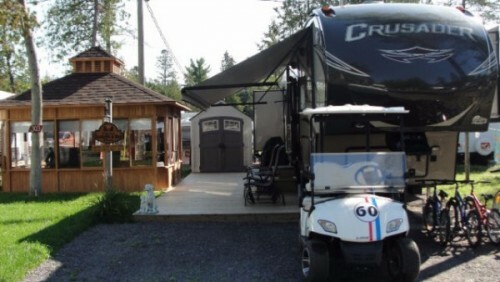 On board fuel station, electric pump, fireplace, 2 washrooms, awesome stereo with indoor and outdoor speakers, 3 TV's. Excellent condition. Lots of room for your toys in the back. This unit also has the cold weather blizzard package. Please call 519-942-5399 to view. 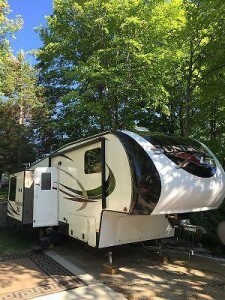 2015 Forest River Wildwood Heritage 366BH Fifthwheel. It is in brand new condition. Has everything and more you could possibly want including central vac 1 full bathroom and a half bath with outdoor access, an outdoor kitchen with mini fridge, bunk room for friends/kids. Welcome to come look at it. Serious inquiries only please. Can send more photos. This is a steal of a deal, paid 90000$. Please call 506-470-0820 for more info. 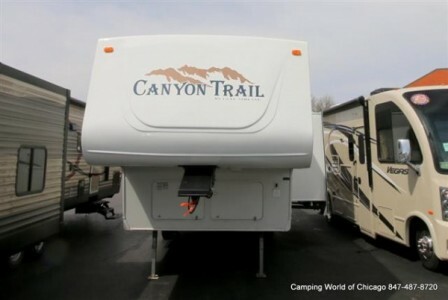 2004 Gulf Stream Canyon Trail 28FRBH Fifthwheel. slightly used. series 59-4-F-Y28FRBH-62432. Nice well maintained and clean. 1 Slide. stored inside heated shop. Well built. Will last long time. no damage. Ready to go. Please call 780-674-6537 for more info. 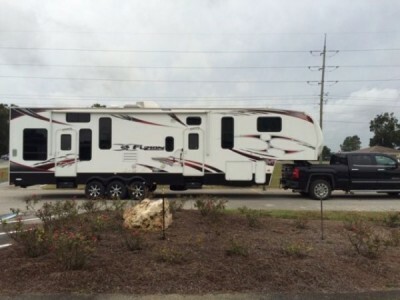 2015 Prime Time Crusader 360BHS Fifthwheel. Exterior: Champagne. Interior: Truffle. Swing Arm Grill, Electric Awning, 15,000 BTU Quiet Cool Premium A/C System, 50 Amp Service, Wired & Framed for 2nd A/C, ETERNABOND Construction, Hartford Cherry Cabinetry, Solid Surface Countertops, Slam Latch Baggage Doors, Thermal Package Plus, Black Tank Flush, Roof Ladder, Spare Tire, EZ-FLEX Suspension System, Radial Tires, Hide-A-Bed, 16" Aluminum Wheels, Fireplace, Ground Control Auto Leveling, LANE Furniture, Advantage Package, Crusader Touring Edition and Champagne High Gloss/ Fiberglass Colored Front. 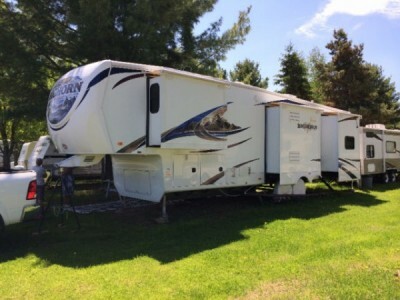 The 5th Wheel is located at Cedar Shade campground in Alfred, Ontario. For more information please call @ 819-664-5048. 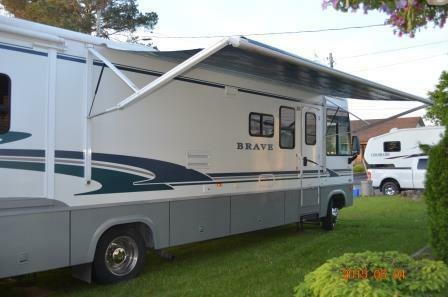 2004 Winnebago Brave 36Ft Class-A Motorhome. This is something you have always wanted. This unit has everything, low Kms and runs great. 36ft Class-A Workhorse chassis, 8.1L Engine 340hp V8, Onan generator, washer/dryer, oversized 4 door fridge, stove, microwave, hydraulic jacks/levellers, separate master bedroom, sleeps 6, electric couch/lounger/bed, large washroom with shower, toilet and sink, outside stereo, electric canopy, two slide outs, two air conditioners, central heating, power front swivel/recline seats, passenger computer table, front drivers door, two TVs, roof mount antenna, roof mount satellite dish, lots of underneath storage. No reasonable offer will be refused. Please call 705-794-2093 for more info. 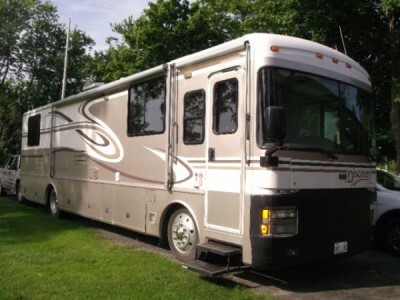 2005 Triple E Embassy 34Ft Class-A Motorhome. 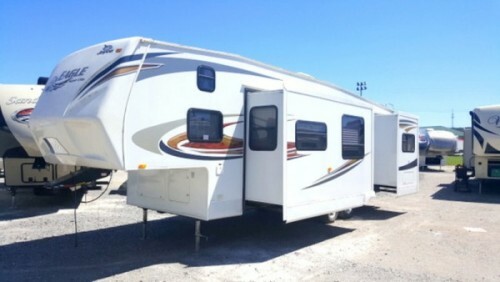 V10 motor, one slide with table and couch, rear bedroom with queen bed, angle shower, separate toilet, lots of closets, pull out pantry, queen air bed in couch, sleeps 6, very clean and well maintained, second owner, Onan Genset generator, lots of extras has to be seen to be appreciated. Please call 807-221-8637 to view. 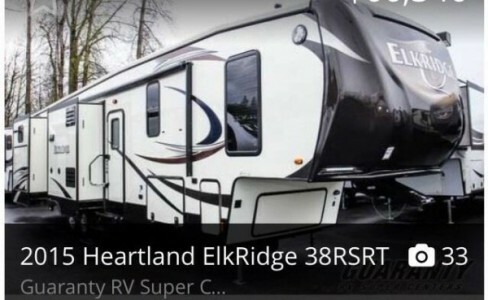 2015 Heartland Elkridge 38RSRT Fifthwheel. Excellent condition used 1/2 dozen times. Well designed family trailer with a king bed in the master. 2 bathrooms and a 2nd entry/exit door. Please call 705-872-7524 for more info. 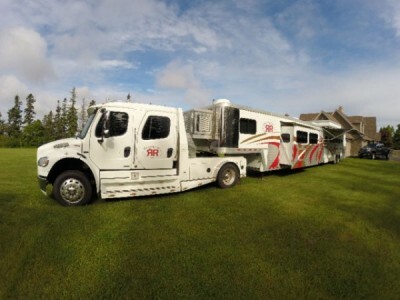 2006 Bloomer 5 Horse LQ Fifthwheel + 2007 Freightliner Truck Combo. Slant load,stud wall. 53 feet long. 8'high, 8' wide, 26' short wall, 10' slide out, 2 remote awnings (one on each side), 2 air conditioners in living area, 100AMP Diesel Generator, Bunk beds in seperate bedroom with private entrance, King size bed in gooseneck, full size bathroom/shower, copper sinks, central vac, slide out BBQ, electric hot water, electric cooktop. Heat is diesel heated hot water. Hay pod with extra water storage, hay mangers with waterers, fans. Air ride, King Pin, fully insulated. Many more options. 2007 Freightliner sport chassis also available, Mercedes diesel engine, air ride, leather. Will deliver. Package truck and trailer. Please call 902-888-9393 to view. 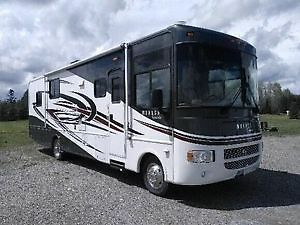 2008 Holiday Rambler Vacationer XL 34PDD Class-A Motorhome. diesel -IBS AB 340 Electric awning. rear camera and side to side Generating six kilowatts 2 including 1 air conditioning heat pump 2 electric fan (bathroom and kitchen). Please call 613-223-4027 to view. 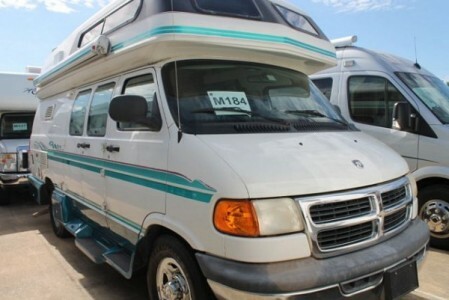 2008 Winnebago View 24J Sprinter chassis with Slide, Mercedes Benz Diesel with only 120,000 kms. well cared for miles, Basement Storage with large storage port underbed access, Ducted Roof mounted AC, Onan 4KW generator, Leather driving chairs, Sleeps 6, Full Galley with three burner gas range, microwave convection, Fridge/Freezer, Stainless sink, Booth Dinette/sleeper with additional storage, nice radius overhead cabinets with drawer space below, overhead bunk, nice all weather flooring in galley and bath area, books and manuals, AM/FM CD Stereo, corner queen bed, private bath with potty and stand up shower, Heated holding tanks, nice skylight, and day night shades. This Winnebago View has been well kept by non smoker, non pet owner. It is very clean inside and out. There are no odors. 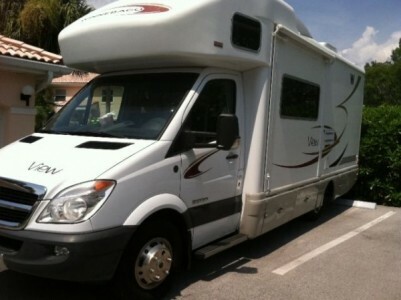 The Sprinter chassis series Class-C RVs are very popular because of the excellent fuel economy at 18-22 mpg. Very few have this option. Winnebago builds a high quality RV and is well respected in the RV Community. This size coach is perfect size to fit in any RV Park in N America and still have all the comforts of home. Watch the video of this RV at https://youtu.be/LOZl6BxbQqg. Please call 239-631-0071 to view. 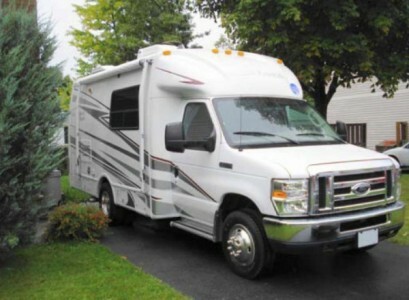 2011 Monaco Riptide 33Ft Class-A Motorhome. Brand new, hardly used. Just serviced. Call Rob at 705-360-3270 or Monique at 705-363-2180. 2011 Heartland Bighorn 3670RL Fifthwheel + Dodge Ram 2500 Laramie Truck Combo. Loaded being sold as package. Please call 519-304-3411 to view. 2009 Jayco Melbourne 29D Class-B Motorhome. Mint condition. Auto-levelling jacks, Winegard satellite, 2 TVs, 3 pull-outs, electric leather couch, 400 watt inverter, Premium Paint package, outside shower, many more, must see. Contact 705-647-4981 or cell 705-648-4142 for more info. 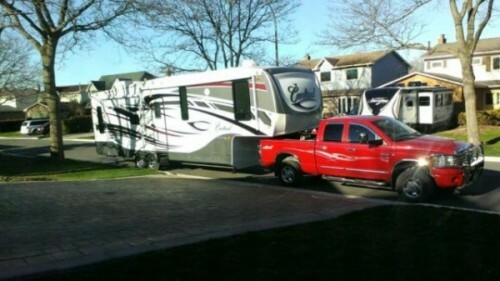 2011 Forest River Cardinal Fifthwheel plus Dodge Laramie 3500 Truck Combo. king size master 3 slide out fireplace ac heat pump. This is a high end trailer. Dodge with 171 kms 6.7L cummins fully loaded with sunroof and leather owned by mechanic and very well cared for undercoated since new Package deal. Please call 905-665-8266 to view. 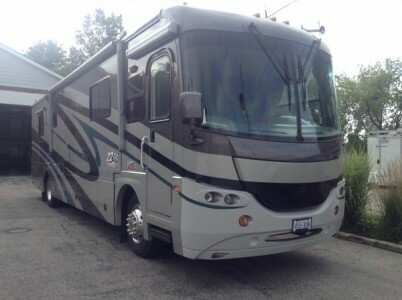 2004 Coachmen Sports Coach 40Ft Elite Class-A Motorhome. 3 slides, awning plus window awnings, 7.5 diesel genie, pass threw basement (heated), 2 door fried, 2 door freezer, stored in heated garage since new, dual air 100 gal fuel tank, 100 gal fresh water, 55 gal propane, 11x22 tires, queen bed. Please call 519-655-2624 to view.